Facial recognition is definitely on our radars now. Though it has been around for years, it has really gotten more mainstream since the newest Apple iPhone, the X, was released. This phone was the first experience with facial recognition that many people had, which made it very cool for a short period of time. As with any new technology, though, there were bugs, inaccuracies, and of course headaches, but that hasn’t stopped other companies, like Facebook, from using similar software. This is all very basic, of course. True facial recognition can get quite complicated, and it’s definitely not 100 percent exact. Let’s say there is a glare from your glasses, for instance. Well, facial recognition software might not be able to determine who you are. Do you have long hair? If it covers part of your face, once again, the recognition software might think you are someone else or it might not register who you are. Who Uses Facial Recognition Software? We know that companies like Apple use facial recognition software, but other organizations are also getting in on the facial recognition game. 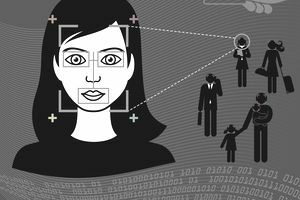 Banks, airports, registries of motor vehicles, schools, and other entities have been or are also starting to use facial recognition, and you are sure to see it more and more as the months and years go on. There are also a number of popular phone apps that use it, and of course, social media pages, like Facebook, are using it too. You might be reading all of this and think that facial recognition is pretty cool. Well, it is, but it can also be quite dangerous or at a minimum, a privacy risk. The big issue, of course, is privacy concerns. When you start using facial recognition software, such as on Facebook, you are giving the company data on yourself that you might not realize. It might not seem like a big deal, but when you think about all of the things that a company might be able to do with that data, it gets a bit more frightening. Experts actually say that you should be protecting your image just as much as your date of birth, Social Security number, etc. In the wrong hands, it could be disastrous. So, the latest big company in the facial recognition game is Facebook. Technically, the social media company has been using facial recognition for years, and you probably use it when you upload a photo and it asks if you want to tag your friends. Usually, it will immediately recognize the other people in your photo who have a Facebook account. How? Facial recognition software. Now, however, they are changing the game a bit. With this new rollout, it will go beyond that and start notifying you about being tagged in photos you might not be tagged in. In other words, it knows you aren’t tagged because their facial recognition is working to identify its users. So in addition to telling you that you are tagged, it tells you that you aren’t tagged. If you are now thinking that letting Facebook freely collect your image isn’t the best idea, luckily you can turn this feature off. If you are using a company, you can simply log into Facebook and click the “Settings” button at the top of the page. You should see “Face Recognition” in the left side column. Click that, and then hit “yes” or “no,” depending on what you want to do. Keep in mind that this option isn’t available everywhere, and it only appears if you are 18-years old or older. That said, keep your young kids off Facebook and DO NOT tag them.